The past couple of years I have started making more and more handmade cards. There are a couple of reasons for this. The first reason is that cards are just plain overpriced! I really don't want to spend $3-5 on a card. The 2nd reason is that I have had trouble finding cards that say what I want them to say! I decided to try my hand at making some cards WITHOUT stamps (until I take the time to really get the hang of stamping). I have been really pleased how the cards turned out. I have incorporated photos into many of my cards and that has added a personal touch that I definitely couldn't have gotten from a store-bought card. I started out with some ready to go blank note cards from Michaels! They have some bins by the scrapbooking supplies that are by Studio G. The items are only $1 each! I got a pack of 6 blank note cards for only $1. That seems like a great deal to me and I don't have to hassle making the card itself! I went digging into my stash of supplies and found some rub-ons that would work great for this project. I found some coordinating paper to match the rub-ons. If you aren't familiar with rub-ons…they are an embellishment for paper crafts. They go on seamlessly and look almost like they were printed onto the paper! They are a great alternative to stickers and kind of have a vintage look to them! I think they look a lot better on cards than stickers do!! Here are some adorable rub-ons from Joann's that would make really nice cards! The rub-ons I used I have had for quite a long time…they are from an older line of My Mind's Eye called Sundress. I love this collection!! I had a set of various items from this line that coordinated. One item was this set was a die cut bird. My mom loves birds and I thought this was pretty. I used mini pop dots to make the bird 3 dimensional. I think that having something up off the front of the card adds a lot to the card! Here are some more ideas for embellishments that could be used to make the front of your card “POP”! I wanted to incorporate a picture of my mom and me when I was a newborn. I scanned in an old photo and then printed it off at home. I printed it in a small size so that it would fit inside the card. I used cardstock to cut out a mat for the photo. I found a great Mother's Day type saying out of one of my FAVORITE scrapbooking resources…the book, Inspiration Station, by Betsy Flot. I love this book!!! I use it all the time for page titles, sayings and cards! I used another rub-on along the very bottom…it actually shows when the card is closed too because of the scallop on the front of the card. I was really happy with how the card turned out. I think my mom will love it! So..if you have never made a handmade card…you should try it out! It really doesn't take any specific skills and I think it will be something your loved one will cherish! Do you make handmade cards? awesome idea! I love making homemade cards for people – it’s much more personal isn’t it? That is adorable! The rub-ons are great. 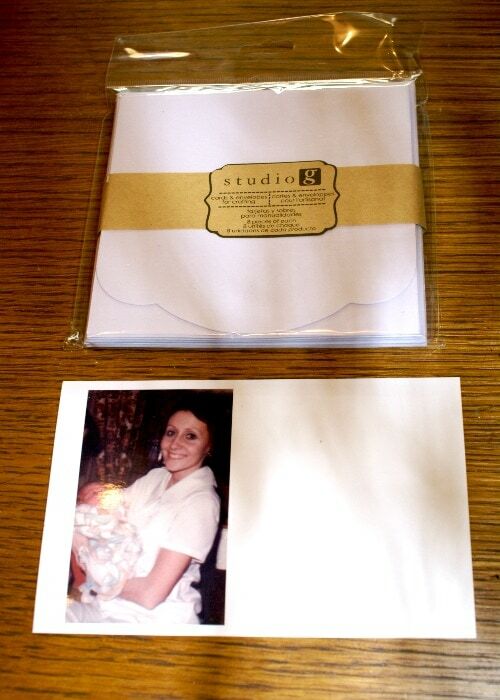 I had never heard of or seen those before but homemade cards are such a great idea. I always avoided them because my handwriting and drawings are, well, it is not a pretty picture but now I think I will give homemade, handmade cards a try. Thanks for the ideas! Thanks Kelly….yes…my handwriting is horrible too! 🙂 Give it a shot…your family will love the effort! 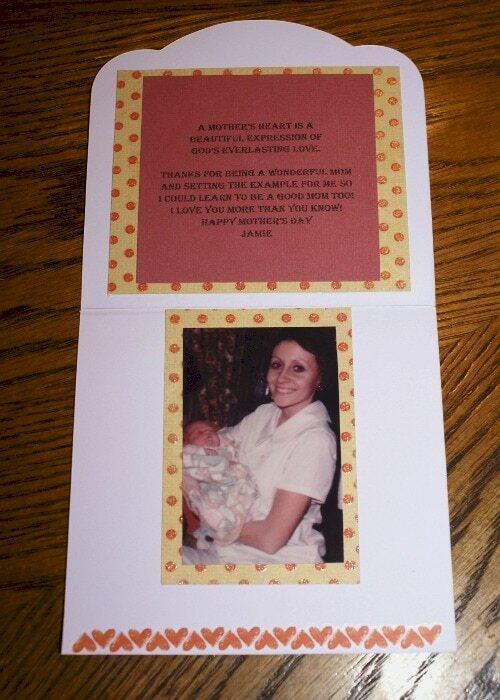 I am Jamie’s mom and she was right…I LOVED the card and will treasure it forever. Just the thought she put into it means the world to me. 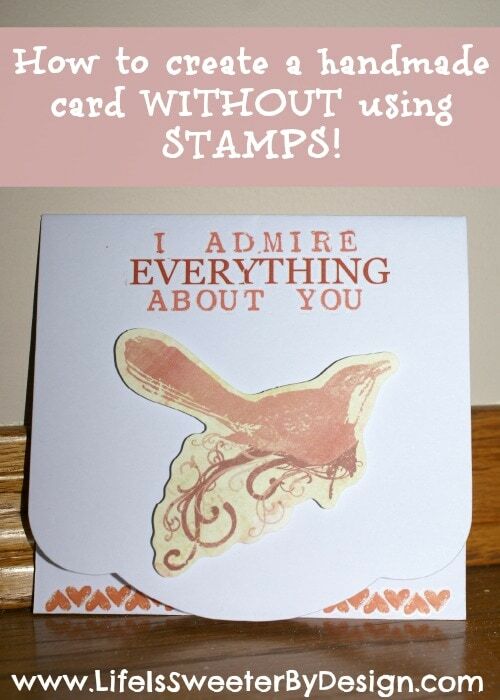 You are wonderful to make homemade cards! It’s such a lost art these days with everything being electronic!